Thanksgiving is over and then bam! It's December. Despite how quickly the year has gone by, it really has been a wonderful year. And with the holiday season in full swing, I'm looking forward to the weeks ahead. I mean, aside from the holidays, there's still football and shopping! Those two things make it a win-win in our house. So if football and shopping are some things you can relate to, then this will be something you'll enjoy. But first, here's a recent sandwich I made for a lazy day of football. 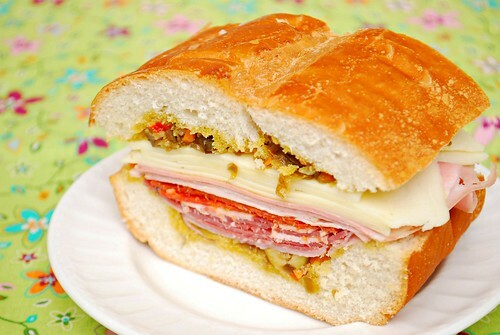 Real N'awlins Muffuletta Sandwiches will be something that will get folks raving. Layers upon layers of sliced ham, genoa salami, mortadella, provolone and mozzarella are piled high in between olive salad soaked loaves of Italian bread. Grab a napkin, folks... you're gonna need one! So going back to football, we still have a few more weeks left to hopefully root on our beloved teams whether they are professional or college. It really doesn't matter to me because I clearly enjoy preparing a spread for those watching the games. This sandwich is one that will have folks asking what the recipe is for the olive salad. Or what was in that sandwich they clearly devoured. It may look like a crazy stack of meat and cheese but it is so worth it! The olive salad definitely needs the time to marinate and have the flavors meld so I highly recommend preparing the salad a day if not two days before. It's also a good idea to get a really good crusty Italian loaf - a round boule would be more authentic but a standard long loaf works fine too (which is what I used). I would even recommend making the sandwiches a day in advance, slice them up after preparing and then wrap each sandwich individually so that the olive salad can get soaked up by the bread for even more delicious flavor. And it helps that the sandwiches are individually wrapped so folks can grab, go and cheer on their team. With Black Friday sales and even Cyber Monday sales over, if you're all about shopping and saving money, I've got some savings to share for you. Thanks to my friends at Kraft, you can save up to $20 on participating Kraft products with coupons redeemable exclusively at Target. Simply go to Target.com to check out the special Kraft coupons and then redeem at your local Target store. In fact, for this recipe I used Kraft Mozzarella and Kraft Provolone sliced cheese to make these Real N'awlins Muffuletta Sandwiches. 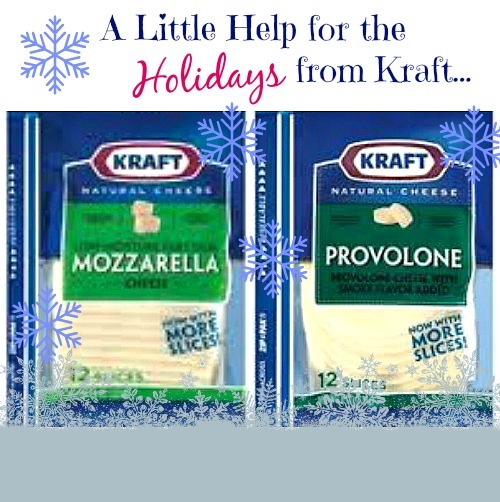 So, get your grub on and then get shopping with savings from Kraft! To make the olive salad, combine in a medium bowl the green olives, kalamata olives, garlic, capers, celery, carrot, perpperoncini, celery seed, oregano, basil, black pepper, vinegar, olive oil and canola oil. Toss to combine and transfer mixture into a glass jar. If needed, add more olive oil to cover the mixture in the jar. Cover with the jar lid and refrigerate overnight. To prepare the sandwiches, cut the loaves of bread in half horizontally. Hollow the middle of each bread halves to create a well for the filling. Spread the olive salad mixture including the oil on each piece of bread. Layer the bottom half of each loaf with 1/2 of the salami, ham, mortadella, mozzarella, and provolone. Top the sandwich with the top half of each loaf and cut sandwiches into quarters. Serve immediately or wrap tightly and refrigerate for a few hours to allow flavors to meld and the bread to soak up the flavors of the olive salad. This is one of my favorite Southern specialties.